RUSH: We read today in the New York Post that Pinch Sulzberger, who is the scion of the New York Times company, is going to change policy abruptly very soon and eliminate the Times Select Service. Now, you may not know what the Times Select Service was. It was the attempt by the New York Times to require subscriptions to get columnists and op-ed columnists and other certain special features, and I think it was priced at $49 a year. What it had the effect of doing was walling off these nitwits from everyone, so nobody had to read ’em other than the people that subscribe to the dead tree copy of the paper every day. So these columnists, like the important Thomas Friedman, the deranged Frank Rich, the miserably and sadly unhappy Maureen Dowd, existed behind this wall of $49 a year that people were not paying. So they stopped being factors in the creation of the Daily News agenda. So the Little Pinch has decided to get rid of Times Select, which is sad. I was hoping it actually would work, just to keep these people, at least well enough, to keep ’em behind the ball. But that’s not the only thing that didn’t work. ‘The Associated Press is closing down a two-year-old premium multimedia service that emphasized nontraditional methods of storytelling, saying it had failed to gain enough traction with newspaper clients. The service called ASAP will be discontinued as a stand-alone service on October 31st. This was originally conceived as a premium service, to help newspapers reach the 18-34 age-group. It had evolved into a broader product aimed at readers of all ages,’ because the 18-34s are on the Internet. They’re not reading newspapers. ‘The whole point of this was to come up with an alternative way of reporting, to get away from the standard stylebook of journalism and let people from all over the country send in their stories and it just never took off.’ An award-winning news service, the AP, has bombed financially. This is the ripple effect of newspapers going under. CBS said that it earned $404 million, 55 cents a share, compared with a profit of 781 million in the year-ago quarter. So CBS’ profit nearly halved versus year ago. So they lost 48% of last year’s profit at CBS. I must tell you, we here at the EIB Network are experiencing none of this. We are not cutting back, nothing. We are a role model for new media and how to do it, and of course we are looked down upon with disdain. It’s fine, by the way, as long as they don’t try to discover our secrets. And of course what’s the secret? The secret is content that people want to listen to and trust and enjoy and be informed by, entertained by, whatever. That’s a concept that just escapes elites who think they’re smarter than their audience, smarter than everybody else. Then when the audience complains, the elites, ‘Ah, you don’t understand our business. Here, take more of what you don’t like.’ (Raspberry). They cram more garbage in their papers and magazines that people do not want to read. RUSH: Dale in Cleveland, I’m glad you called, sir. Welcome to the EIB Network. CALLER: Well, thank you very much. Rush, you mentioned awhile back that the media elite look down on their audience and say — these were your words — they think they’re smarter than you. CALLER: Well, Rush, don’t you think you’re smarter than us? RUSH: I understand what you mean. You’re trying to get me to fall into my braggadocios personality that irritates the libs, but it’s a great question you’ve asked, because I think the reason I’m answering it this way is, I don’t come in here every day with anything but respect for you. I expect that if I talk about some of the various aspects of energy production or global warming, everybody in this audience is smart enough to understand it. So I don’t approach you like you’re sixth graders with no knowledge whatsoever. That’s how elites approach everybody, particularly in the media. They have a condescending contempt. They think that they’re so stupid that they can pull the wool over their eyes with lies and deceit every day. With some people, they’re right. But that’s what’s great about this audience. This is the most informed audience in broadcast media — not according to me; the Pew Research Center for People and the Press did a survey. So attitudinally, I come in here, and I think everything I talk about I can make you understand because you have the ability to understand it. CALLER: — and you expect us to know what it means. RUSH: I do. Do you know what it means? CALLER: Oh, yes, I do. RUSH: See? I was right. RUSH: No. Do you know what the word ‘calumny’ or calumnies means? RUSH: You do or don’t? RUSH: You do, all right. CALLER: Well, yeah, it means commotion. RUSH: No. I have a story about it. 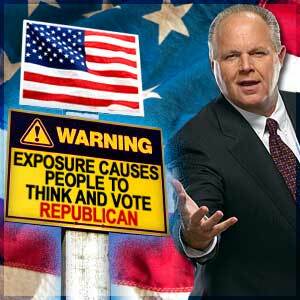 RUSH: I was not checking to see if you knew. There’s a story. Conrad Black was on trial in Chicago for looting his company, Hollinger, and so forth, and he was prosecuted by the office of the US attorney. The US attorney there would be Patrick Fitzgerald, and one of the techniques that the prosecution team used in opening arguments was to share e-mails that Conrad Black had written friends using the word ‘calumnies.’ He had a blue-collar jury, and they were trying to illustrate that this guy is so high up in the clouds, he’s such an erudite, intellectual snob, that he doesn’t even speak real English. RUSH: So they used an e-mail where he discussed calumnies and then got irritated when somebody didn’t know what it meant. My only point here is that there’s a lot of resentment for achievement. There’s a lot of resentment for people that use the language correctly. I have always — from the moment I became someone that others would ask, ‘How do you succeed in radio?’ — had the first thing I say be: ‘Learn to read, write, and speak the English language to the best of your ability. That alone, however you do it, will convey education and intelligence.’ This is why so many of us are so concerned about illegal immigrants not being forced to learn the English language. It’s a cultural thing. We want the best country we can have. We want the most educated and informed people we can get. If you continue to baby people and treat ’em like they’re idiots, they’re going to stay idiots because you’re going to get down to their level to make sure they understand things, and you’re not going to even care if they understand things. So I approach this program each and every day with the confidence that everybody here will either: A, know what I’m talking about and understand it. therefore the communication link will occur, or they will be made curious enough to want to know; both of which are win-wins. If my attitude was, ‘I’m smarter than you, and I don’t care whether you understand what I’m saying. In fact, I want you to stay dumber than I am,’ then I wouldn’t have an audience, and that’s one of the myriad things that’s happening to the Drive-By Media.